Explore Park City neighborhoods by clicking on the links below. Locate the Park City community that fits your interest and easily search real estate for sale in that area. The Park City Board of Realtors has broken the MLS down into more than 30 distinct areas or neighborhoods in order to better describe Park City geographically. Each community or Area is also represented by a number. 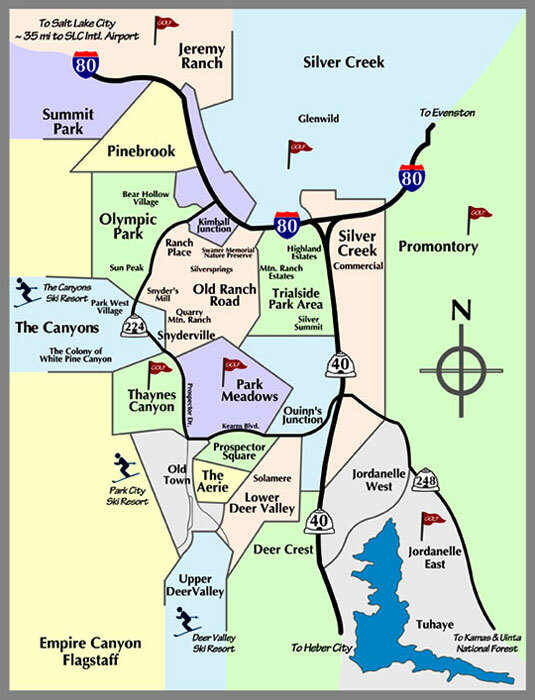 Areas 1-9 represent the city limits, neighborhoods 10-22 are the Snyderville Basin and Kimball Junction Areas of Park City, and areas 22-23 are for Jordanelle Reservoir real estate. If you are interested in Heber Valley and Midway real estate, you will look in areas 26-29. To quick and easily view all Luxury real estate in Deer Valley, visit our Deer Valley Real Estate page. While the breakdown into smaller communities helps in defining Park City and the outlining areas, it does not mean that all things in a community are equal. Subdivisions exist within all of these communities which will have their own distinct feel and benefits. As you begin to think about buying or selling real estate in Park City, the first step is to surround yourself with qualified professionals. Give us a call today! Contact us anytime for more information about local Utah areas! Let our years of real estate experience help you find the perfect property and neighborhood in Park City or Deer Valley to best fit your needs. Cindy can help you negotiate the best possible price and terms. Call Cindy Wallace at 435-901-2781 or just fill out the form below.